Prince Bandar served as the Ambassador of the Kingdom of Saudi Arabia to the United States of America from October 24, 1983 to September 8, 2005. Prince Bandar was appointed Chief of General Intelligence by the Custodian of the Two Holy Mosques King Abdullah on July 19, 2012 and has served as Secretary-General of the National Security Council from October 16, 2005-January 29, 2015. Prince Bandar was born in Saudi Arabia on March 2, 1949, at Taif, the summer capital of the Kingdom, the son of His Royal Highness Crown Prince Sultan bin Abdulaziz Al-Saud, the Deputy Prime Minister, Minister of Defense and Aviation, and Inspector-General. He is married to Princess Haifa Bint Faisal. He has four sons and four daughters. Prince Bandar was appointed Ambassador to the United States by the Custodian of the Two Holy Mosques King Fahd bin Abdulaziz Al-Saud on September 27, 1983 and presented his credentials to President Ronald Reagan on October 24, 1983. On August 7, 1995, he was promoted to the rank of Minister. 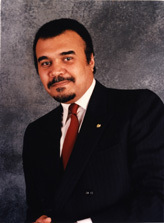 During his tenure in Washington, Prince Bandar served as the Dean of the Diplomatic Corps. Prince Bandar graduated from the British Royal Air Force College at Cranwell, England, in 1968 and was commissioned as a second lieutenant in the Royal Saudi Air Force (RSAF). He received pilot training in the United Kingdom and the United States, and has flown numerous fighter aircraft including the JP 3-4, T-38, T-33, F-5, F-53/55, F-102, and the F-15. During his seventeen-year military career he attained the rank of lieutenant colonel, commanded fighter squadrons at three RSAF bases, and undertook program management responsibilities in the major RSAF modernization project Peace Hawk. In addition, Prince Bandar carried out special assignments in Washington, DC, during the debates between the U.S. administration and the Congress concerning the sale to Saudi Arabia of F-15s in 1978 and of AWACs in 1981. In 1982 he was assigned to Washington, DC, as the Kingdom's defense attaché. Prince Bandar completed his postgraduate work in several U.S. military schools including staff courses with the Air Command and Staff College at Maxwell Air Force Base in Montgomery, Alabama, and with the Industrial College of the Armed Forces at Fort McNair in Washington, DC. He received his master's degree in international public policy from the Johns Hopkins University School of Advanced International Studies, Washington, DC, in 1980. As special envoy for the Custodian of the Two Holy Mosques King Fahd bin Abdulaziz, Prince Bandar was involved in cease-fire negotiations in the Lebanese civil war, and has been instrumental in resolving a number of regional and international crises, such as the Lockerbie incident in 1999. He was the Saudi delegate in the Gulf Cooperation Council mission observing the 1991 Middle East peace talks in Madrid, and has been a regular member of the Kingdom's delegation to the United Nations General Assembly since 1984. Prince Bandar has been awarded many medals and decorations, including the Hawk Flying Medal of Aviation, the King Faisal Medal, and the King Abdulaziz Sash, as well as honors from other nations.